After Harvey: Houston Reservoirs Have Finally Discharged All Floodwater : The Two-Way In late August, Hurricane Harvey brought record rainfall to Houston. In mid-October, the city's two large federal reservoirs are finally back to empty. Filled to the brim by Hurricane Harvey's rainwaters, the Addicks and Barker reservoirs are finally empty once again. 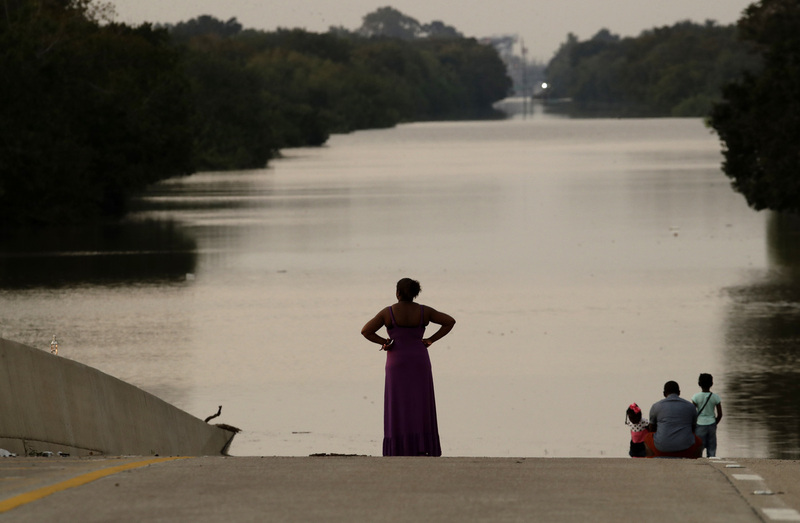 In this photo from Sept. 1, days after the hurricane first made landfall, a family looks at floodwaters in the Addicks Reservoir from a closed freeway. In late August, Hurricane Harvey brought record rainfall to Houston. In mid-October, the city's two large federal reservoirs have finally been emptied of the massive amount of water that had filled each of them to the brim. The U.S. Army Corps of Engineers says that as of late last week, both the Addicks and Barker reservoirs "are empty for the first time since the rains associated with Hurricane Harvey began in late August." The reservoirs are normally dry; they include parks and trail areas, as well as parkways. The watershed area of the Addicks Dam is 136 square miles; the watershed of the Barker Dam is 130 square miles, the Army Corps says. After making landfall on Aug. 25, Harvey dumped more than 50 inches of rain in parts of Houston, putting the city's infrastructure and bayou network under extreme pressure. Sitting on either side of I-10 west of Houston, the dams of the Addicks and Barker reservoirs didn't fail, but when huge amounts of floodwater rose to record levels above the reservoirs' pool elevation and threatened a wider area, the Army Corps decided to release water — a move that was expected to cause more flooding downstream. "Controlled releases may cause moderate flooding," the agency said at the time. "Waiting until water flows past uncontrolled spillway may cause severe flooding." That decision has led to criticism and legal action from residents downstream of the reservoirs. An Army Corps representative tells the Community Impact newspaper that the delay in reporting the dry reservoirs came as the agency was given legal guidance. On Tuesday, Col. Lars Zetterstrom, the Army Corps' Galveston District commander, said in announcing the dry reservoirs, "Flood risk management and enhancing public safety are at the forefront of all we do." The Addicks and Barker dams were built in the 1940s; as Houston Public Media reports, the city is now seeing movement on a long-delayed flood control project, including the construction of eight new bridges over Brays Bayou.